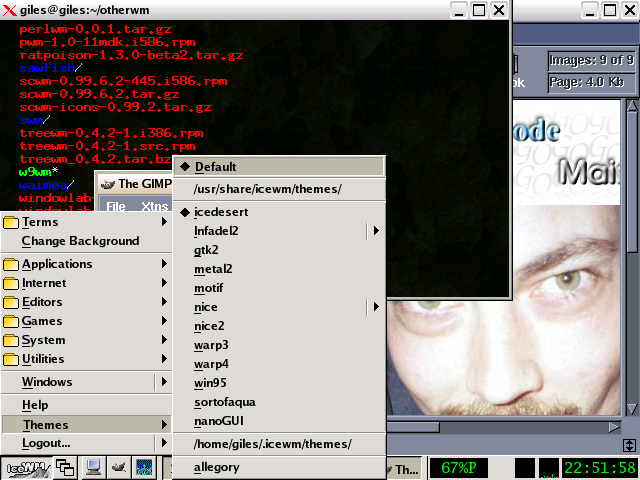 Ice WM with its default theme. Ice WM using the "sortofaqua" theme which imitates Mac OS X.
I used version 1.2.12, which was the latest version available in September 2003. I used the RPM packages available from their sourceforge site. Development has been continuous for several years now (I can say that with certainty because I've been a long-time user, and the version number never stayed the same for more than three months). No man page. Documentation is in HTML format, and is shipped with the window manager package. It's quite thorough and reasonably well done. Ice WM doesn't use shaped windows, but is otherwise extensively themeable and there are a lot of themes available. As I've mentioned elsewhere, I've used Ice WM a great deal, and my views may be somewhat biased. Despite extensive themeability, Ice has always seemed to me to one of the plainest of all WMs, and it seems to me that it stays out of your way and lets you get your work done. I've always liked the good combination of GUI elements and key bindings. It has some nice touches, like the laptop battery power indicator in the taskbar. The default focus style is "ClickToFocus," with "RaiseOnClick." This will be very familiar to Microsoft Windows users. In fact, pretty much everything about it (with the exception of workspaces) should come naturally to Windows users. The focus style is easily changed in the configuration files. 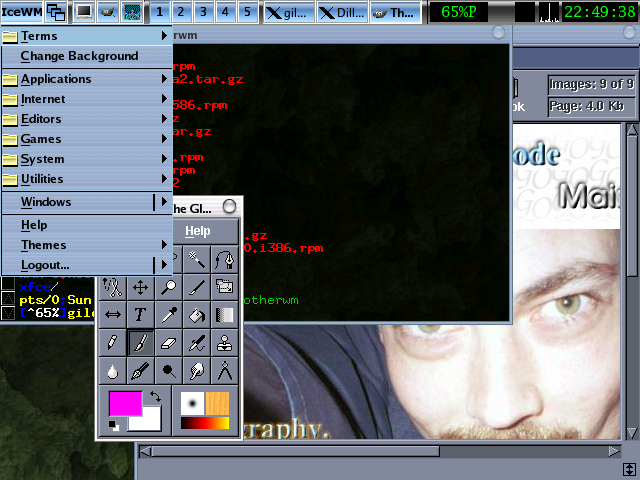 The similarities to Windows make more sense when you know that Ice started out to emulate Windows and OS/2. Windows-like key combos (Alt-Tab to select windows, Alt-F4 to kill) are supported. Current versions (the last couple I've tried) have major issues with Xinerama: with my vertically arranged screens, I have to chase the menus around the screen. Truly: they jump away from the pointer. Flexible appearance. Similarities to Windows. Sane window placement (looks for empty space). Keyboard friendly. Using Ctrl-Alt-Fn to switch virtual terminals can kill it when several windows are open. Older versions had an issue with menus appearing but immediately disappearing before you could select from them. Ice WM has a lot of actively maintained translations, and there are always new themes available.